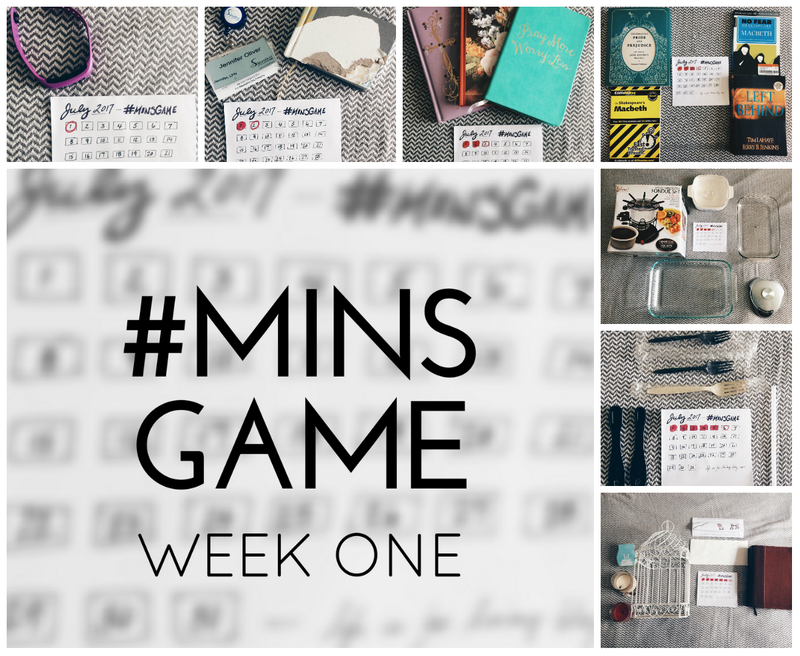 In my last post, I shared my plans to play the Minimalism Game this month, a somewhat crazy challenge inspired by The Minimalists . To play, each day, you get rid of something you no longer want/need/find useful. On the 1st, you get rid of one thing. On the 2nd, two things. On the 3rd, three things. It starts easy, but by day 28, you're scrounging for twenty-eight more things to eliminate from your life. By the end of the thirty-one days, you'll have removed around 500 items. Now, I mentioned how I've already Kon-Mari-ed and purged my belongings twice since early 2016. My husband has been seriously doubtful that I will be able to round up this many more items to get rid of at this point, and I confess, at times, I am doubtful as well. But. With a move on the horizon, I feel we must try to get rid of as much excess now as we can, before we have to box it all up and carry it down three flights of stairs. So I began with an item that has been sitting out on my dresser for months, collecting dust as it stares me down, reminding me how much weight I've gained and how much I need to exercise. A Garmin Vivofit. I listed it on eBay, and within like two days, it sold at my Buy It Now price. Just like that. Something I don't need, out of my life, and mo' money in my bank account. Day Two included some random items in my nightstand. A name badge from The Worst Job Ever that I was holding onto to remind myself just how horrible a job can be. And my favorite little Jane Austen coffee table book that Annie chewed when she was a puppy. I was saving the pages to use for something crafty, but let's face it. That's never gonna happen. Day Three. Three journals, because no sane person requires ten journals. I realized that I have a horrible habit of buying a new journal, writing on the first page or two, putting them away, and buying another new journal. Seriously, almost all of my journals are like this. It's terrible. So, I decided to rip out those first two used pages and try to sell these perfectly good journals at my next yard sale. On a related note, Day Four involved a few unnecessary books. How many Macbeth aids does a former English major still need? Zero. I didn't feel like finishing Left Behind, so I'm not gonna force it on myself. And this book on Pride and Prejudice? Another well-meaning purchase that I just can't get into. One thing that I'm trying to teach myself as an adult is that, if I don't want to finish a book, I don't have to. There's no time to waste reading books I don't want to read at this point in life. You know? On Day Five, I wandered into the kitchen. I realized we have entirely too many casserole dishes. I no longer see the point of owning so many duplicates. I mean, when would we ever need to bake seven casseroles at the same time?!? So we got rid of our three least-used ones (and by least-used, I mean never used). A kitchen scale we've used maybe once. And a fondue set that I've had since 2012 and used exactly two times. More kitchen junk on Day Six. And I do mean junk. You never know when you might need a plastic fork, am I right? I picked up this bad habit from my parents, who have an entire drawer dedicated to restaurant ketchup packets, Taco Bell mild sauce, and all the disposable forks, spoons, and sporks you could ever need. The husband and I are trying to get rid of anything plastic in our home, and we still had this reusable plastic straw and these plastic measuring spoons. So into the yard sale box they went. By Day Seven, I was finding more garbage and even tackling a few sentimental items. On the left, you will see two candles I do not like to smell, but are almost used up, along with an entire pack of foul-smelling Scentsy wax that I loathe. Then there's the birdcage that held cards at our wedding but doesn't match our decor now, two hand-written letters from a friend and my sponsored child, and a New Living Translation of the Bible. A whole lot more to go. Are you playing along with me? How is your #MinsGame going? What junk do you find yourself hanging onto? What is easiest to let go? What's the hardest? Share in the comments! Jenny I am so proud of you. Love your blog. I honestly don't think I could do all the things you do. Wish I could. Love you. I've played #minsgame four times. The last time was so hard I don't think I can play again for a while. So much fun! Enjoy! !